Shopping for your very first motorcycle? Start here. The 2015 Honda CB300F promises to be fun to ride, affordable and incredibly cheap to run. It's the perfect learning tool for new riders. 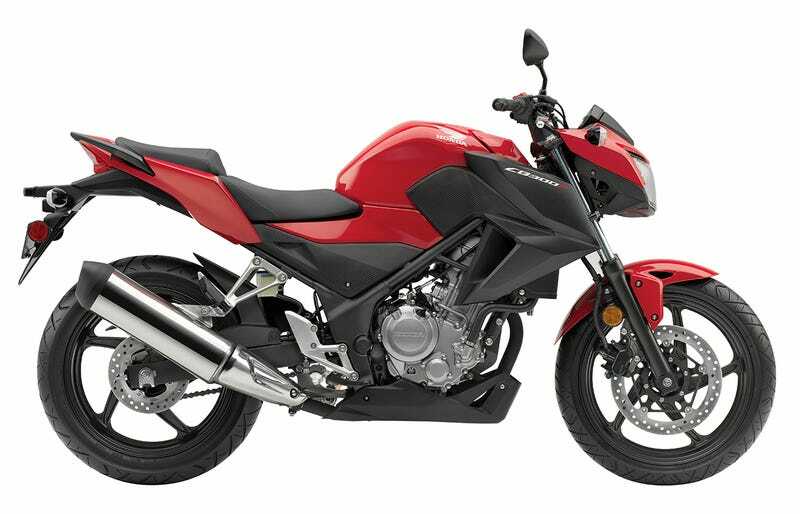 The CB300F is a naked version of the new-for-2015 Honda CBR300R, itself an update of the amazingly capable CBR250R. Shorn of its plastic fairings, the bike sheds 9lbs and $400, now coming in at just 348lbs (wet) and $3,999. And, oh yeah, did we mention the 71mpg fuel economy? The tall, flat handlebar will alter the ergonomics, giving riders a more upright, spacious riding position that will better facilitate low-speed control and vision. The now-286cc, liquid-cooled single develops 30.4bhp at 8,500rpm and 20lb/ft of torque at 7,250rpm. We haven't seen a dyno curve yet, but Honda embiggened the previous 250's motor by increasing its stroke, so this new 300 should gain useful, accessible shove lower down in its rev range. The CBR250R was already a surprisingly flexible, friendly engine with which to make progress, so this yet another positive sign of what should be an even better bike. Why buy one of these instead of financing a GSX-R1000 as your first ride? Well, much more so than cars, motorcycling is a sport. If you wanted to learn how to play basketball, you wouldn't schedule your first game against Michael Jordan; he'd metaphorically slaughter you. Picking up a fast 600 or 1000cc race bike will literally kill you and, even if you do somehow manage to survive, all you'll have learned is how scary motorcycles can be. Instead, bikes like this CBR300R are specifically designed to help you develop the skills necessary to become a competent rider. A year or two spent on one of these will give you the ability to actually ride something faster with something approaching competence. Why am I so excited about a new model that's just a slight modification to an already-existing bike? Well, with the Rs in its name and the sporty fairing, I always felt the CBR250R was a very misunderstood motorcycle. It was never meant to be a high-revving race-replica, instead it excels as a competent all-rounder. Something you can ride everyday through heavy traffic, in all weathers, with a passenger or even on long trips. It gives you the confidence to do all that, even if you've never thrown a leg over any other motorcycle — that's extraordinary. Now, the CB300F not only has that larger motor, but also more American-sized ergonomics and a more city-friendly riding position. All at a lower price. One of the best motorcycles available just got even better.